A picture of "Project Atlantis". Mario's Castle was an unreleased game that was going to be released on Nintendo's unreleased handheld console, "Project Atlantis," and was presumably part of the Mario franchise. 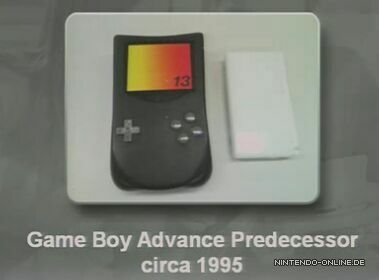 Project Atlantis was going to be a successor to the original Game Boy and if the handheld was to have been released, the Gameboy Advance would likely have not seen development. The handheld started work in 1995. In 1996, issues of Electronic Gaming Monthly and Gameinformer started listing specs for the console, including that it had 32-bit color, four face buttons and 3" by 2" LCD screen. The magazines also said that it was to be released in late 1996 or early 1997. Nintendo officially confirmed the handheld's existence, but delayed the official release date until late 1997; the handheld's release would also miss this date. It would then be cancelled without public acknowledgment sometime around 1997 or 1998. 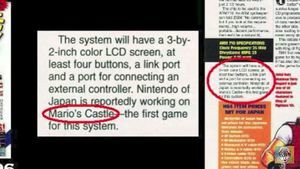 In the same Electronic Gaming Monthly magazine which listed the specs, it was also mentioned that there was going to be a new game titled Mario's Castle for the system, and it was going to be produced by Nintendo. Almost nothing else is known about the game, except that it was going to be a launch title for the handheld. It could be assumed that the game was cancelled along with Project Atlantis. No other information about the title has been given from any official gaming media source other than the Electronic Gaming Monthly article. It is also unknown if the game was incorporated into another game at a later time. There might be some assets from Mario's Castle hidden away somewhere, but it isn't likely. LSuperSonicQ's video on Project Atlantis and Marios Castle. A scan of the EGM article talking about "Prject Atlantis" and Mario's Castle.